Life is about the journey, but that doesn't mean you want to be stuck in roadside shutdown when your car battery runs flat. 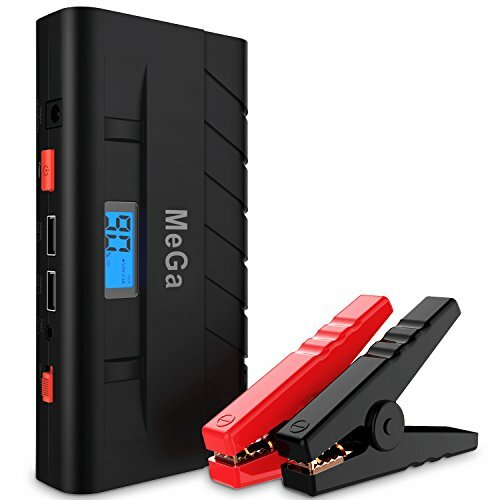 With 500A Peak of power, the Jump Starter by MeGa packs enough of a punch to kick start petrol engines of up to 5L or diesel engines of up to 3.5L.The charger's 15000mah battery has enough capacity to jump start your engines over 30 times. Whether you need light to change a tire, inspect an engine, or need to warn oncoming traffic that you are broken down on the side of the road, the ultra-bright LED flashlight in Boost have you covered. It has 3 modes LED light (high, strobe and SOS).? The LCD screen shows exactly the remaining power and output voltage, which helps you make better use of the power and protect your devices. Dual USB Ports It equipped with dual usb ports, with 15000mAh capacity, you can charge your cellphones, tablets, kindles etc. The output voltage can be switched between 12V/16V/19V, indicated on the LCD screen. The unit is supplied in a high quality case. Unlike traditional bulky jump starter packs, it's small enough to store in your glovebox and light enough to pack in your bag. ATTENTION: Connect device correctly(be careful not to mistake the connection between "+" and "-"). If you have any questions about this product by Mega Brands, contact us by completing and submitting the form below. If you are looking for a specif part number, please include it with your message.